With that said, I started using YNAB Pro way back in 2007 when there wasn’t even multiple account registers, it was just one big transaction log. I’ve been very involved with the beta process in YNAB 3 and YNAB 4, but since the method has worked so well with my finances, I have become less and less involved in the forums and only periodically look for threads that peak my interest. Going back to when I started, I had a good-paying seasonal job with very seasonal expenses (i.e. college student). I used my credit card for all purchases, and always paid it off before the due date to maximize my rewards. I thought I had a paid-in-full credit card, however, I was actually living on the credit card float. I could not pay the entire balance in full with money in my account the day I started YNAB. That was a wake-up call for me. Luckily, I had some big paychecks come in and I got off the credit card float. However, I was still using YNAB like a “normal” budget where I budgeted based on expected income. This is dangerous. The real light bulb moment was when I decided to build a buffer (yes, that’s what it was called back then!). Once I built a buffer and began marking paychecks as income for next month, that is when my finances really hit cruise control and I finally had control. Money had not been an issue since, and that was somewhere around fire season (summer) 2008. I’m a user that wants to support YNAB because of what the software has done for me. However, YNAB4 is absolutely amazing, and I have a hard time signing up for something monthly that I am dependent on. So, this post is mostly for me to compare YNAB4 to nYNAB, and help to make my assessment as to whether or not I will upgrade. Alright, enough about me. Here goes my feedback. I’m going to try to rank things in a logical meaningful order to ME. 1. The universal Undo/Redo feature is great! 2. Direct connect is awesome! I was shocked to be able to import transactions within my retirement and health savings accounts! It also downloads Target and Capital One which pocket sense did not! Win. 3. I discovered that you can now set the zoom in google chrome, and it remembers the settings for that website. For example, I set the zoom to 75% for my nYNAB budget, and then when I go to other websites it reverts back to 100%. Awesome! Adjustable font! 4. I’m happy to see the goals feature implemented. It is very simple in this version, and doesn’t accomplish as much as I would like it to, but it is a start. You will see enhancements I will like to see further down. 1. Post-dated transactions need to be able to affect the register and budget. The register and schedule need to be separate. I need the ability to enter to register transactions that are committed. For example, I have a recurring transaction for all of my automatic payments. Once I receive the statement, verify the date and amount of the next scheduled occurrence, I would enter that in the register from the schedule so that my account and category balances reflect what I am absolutely committed to. 2. Bring back income for this month and income for next month. That was the life-changing rule from YNAB Pro that got me to where I am today. 3. TBB needs to behave like ATB YNAB4. I need clear monthly breaks. When there is budgeting in the future (causing future month’s TBB to be negative), if you decrease a budgeted amount in the current month, it should increase the current month’s TBB and not flow forward to the future months’ TBB. 4. Payee settings. With direct connect, we need working payee settings just like we had in YNAB4. Otherwise things will get messy quick. 5. I would like an offline desktop app. 6. I would like to be able to see multiple months side-by-side. I will still not be upgrading to nYNAB at this point as there are several dealbreakers for me. YNAB4 is just too good and even if nYNAB was free, I would not be making the switch until that happen. That’s before I even factor in the price of permanent monthly subscription that puts me at the mercy of whatever design changes the YNAB team dreams up. That’s scary. I guess I'm trying out nYNAB for the next 30 days as well, as I had to sign up for a free trial to keep my username for this new forum (well played, YNAB ;). I'm definitely interested to see what you think at the end of your trial. I also love YNAB4, and at this point in time, I am probably unlikely to switch. I really don't want to pay the yearly subscription, which would cost me more in Cdn dollars. But I do like how nYNAB functions. I do wish they had the month-to-month view in the new one. Also, there's no calculator, which I use all the time. SnowLynx there's no calculator because the move money tool replaces its function. Instead of calculating the money to add to a category, you use the MMT to move money from TBB. If you really feel like you need a calculator, you can always do the calculation in the budget cell. WordTenor I was about to be very confused about doing the calculation in the cell but then I realized you said _budget_ cell. I am constantly doing split transactions and I want to split the tax along with the line item amount. I wish there was a calculator in the move money tool. That is where I first needed to do some calculations after migration from YNAB4 as some of my category balances had changed. Thank you for sharing your view Joel . I do share some of your concerns, and converting from YNAB version 4 to the current version had not been easy for me too. Of all of new YNAB potential customers, perhaps YNAB4 users are the most difficult ones to convince. I believe that is because so many had benefited (and continue to benefit) from the version 4 method and the software. I waited a year after the initial release of the new YNAB before I converted. And sure, I too would like to be able to see more than one month side by side, and to be able to fence off months. At the moment, it is simply not there and it may never be implemented. Still, after almost one year of using the new YNAB, I think I adjusted to the new functionality and some of the changes to the method. I am quite happy with some of the added functionality such as the goals feature and also the functionality of the mobile phone app which allows me to do almost everything I need. I believe that for YNAB as a company to remain in business, and to be able to develop further in a competitive landscape, they had to adopt a different business model. I can only imagine how challenging it must have been to the company to make these changes and take great risk with the aim to advance further. I personally feel that I owe so much to YNAB, that I do not mind paying an annual fee. For me personally, I think it's worth it, even though I cannot use some features such as automatic download of transactions because I live overseas in Europe. I also owe to this great and inspiring community of users, most of whom are so helpful to new users. In the last four years, my net worth grew from €13K to €204K -- all because YNAB made me more aware of my spending and allowed me to prioritize properly (mainly, stick to a budget and ensure excess funds are used to pay off the mortgage). Keep up the good work, and keep on budgeting, and yes, please try the software for yourself. Your YNAB journey is beautifully impressive - thanks for sharing! We love hearing feedback from such longtime users because you know just how far YNAB has come, so we take your comments with that in mind! 1. Post-dated transactions do affect your budget, but not as far as considering those funds already spent. 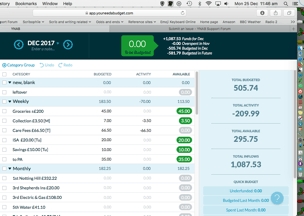 The Quick Budget feature in the new YNAB takes into account any post-dated transactions as Upcoming and allows you to budget for them in your budget. This way, those transactions you're already committed to can be planned for in your budget. 2. While we understand just how effective it can be to set aside funds for a certain month, the new YNAB is a bit more flexible. At any point in time, you can move forward and budget funds towards next month (or the month after). This allows you to stretch the funds you currentl have as far as you can. 3. Flowing well from the point above, we only suggest budgeting towards the future if expenses for the current month are covered - this prevents that negative future budgeting being covered by new income in the current month. There isn't a clear cut line here because we want things to be flexible and work not just in the current month but with future months in mind as well. 4. Payee settings are alive and well in the new YNAB! 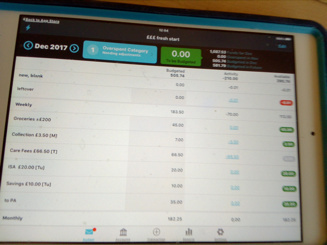 To access them, you'll have to use the web app - click on the name of your budget in the upper left hand corner and select Manage Payees. 5. We don't have a desktop app for the new YNAB right now, but it's in our plans. Although we aren't able to commit to how much offline capability that app will or won't have, we are working hard on making it a great companion to the web app. 6. The side-by-side feature hasn't been brought to the new YNAB, but I'll let our development team know you'd like to see it! This will add it to the list of possibilities for the future! P.S. - I'm moving this over to our Tips & Tricks section, just in case anyone wants to add in on what they do to handle like situations! As far as points #2 and #3, it should be possible to do it both ways. There's no reason to restrict one or the other. There can be an option to apply TBB to a specific future month (like in YNAB4) or always the current month (like in nYNAB). Additionally it would help avoid the issue outlined in my next paragraph. The problem with your reply #3 is when you need to change a budgeted value in the current month that will be based on spending that hasn't happened yet and you've already started budgeting into a future month. If you increase the budgeted amount, there's no change in the current month TBB which makes it difficult to keep the current month revenue neutral and no indicator that your future month TBB has gone negative. I've been harping on this shortcoming for 2 years now, and it's, in my opinion, a fatal technical flaw in the implementation. nolesrule I agree with you on stealing from the future, all they would have to do is change the color of 'Budgeted in Future' to red if money was stolen from the future or simply change the background of TBB in the current month to red. Regarding Joel 's dealbreakers #2 and #3, I think I have a way to mimic the YNAB4 method in the nYNAB. I agree that the clean breaks of months is what makes YNAB4 so powerful. "Ring fencing" is months is critical to correcting bad behavior. I used YNAB4 for three years, holding off on transitioning to the new web-based approach for the same reasons. I thought I'd give it a try. Here's my idea: Whenever you get "inflow" money, do NOT categorize it as "Inflow: To Be Budgeted". Instead, create 12 budget categories, one for each month of the year (e.g. "January Budgeting", "February Budgeting", ..., "December Budgeting"). Deposit the entire amount in the budget category for next month...(remember "living off of last month's paycheck"...). For example, I received a paycheck on December 1, so I entered it as a deposit into my "January Budgeting" category. Then, come January, reverse out everything in that budget category, and reallocate to your regular monthly budget categories. I may be wrong, but I think this will create clean monthly breaks and address the problem with accidental overspending in the current month being "blindly" funded from future months. This is what nolesrule was rightly complaining about. You will now see negative amounts in the current month. This may not be the officially supported approach, but if it works in practice to address this terrible shortcoming of nYNAB, I would love to get everyone's thoughts on it. Stantonio Do note that in order for reports to accurately show income, all income needs to flow through the "Inflow: To Be Budgeted" category. If you categorize that money directly to a category, YNAB considers it negative spending, like a return on a previous purchase, and it will show up in the Income / Expense report within the Expense section. You can still do your approach, but you'll need to categorize income to "Inflow: To Be Budgeted" first, then budget the same amount to the monthly category. Ben That’s a good point. However, for me i think it’s worth the trade off. Ring-fencing months is just way too important to let go of. Stantonio Why would you make a category for each month? I have one called "Money for Next Month". Since I'm buffered, I put all December money in there (after making it TBB first and then assigning it, so reports are accurate) and will release it January 1. Then, all thru January, I will fill it up again and release on February 1. Having 12 different categories seems very over-complicated. Really the only reason I want to upgrade is to have the transactions ordered in the order they were entered (by time). Joel I completely agree. You should give nYNAB another try with the trick I described above. oh man, it’s really confusing that we both have the username Joel. These forums stink. I need the income to show as such for reports (taxes). But I've been jumping ahead to the following month and budgeting any income to its own holding category there. In the current month's header I see the amount of income I'm dealing with currently, and if that is even then I'm good. (It probably helps that I'm doing some income leveling and habe set our monthly amount to use as income to a nice even hundred dollar amount. Not sure yet if a discrepancy would be likely, but so far I like being able to easily cross check my budgeted amount. ) In the category next month I can see how much income I've accumulated for 'next month'. Still working on my trial, and have only crossed one month boundary, but so far so good. Agreed, much of the other changes are things I can deal with, but I really didn't want to lose the ability to force myself to leave next month's money alone. Start dipping into it a little and it's a slippery slope! If needed/desired, I want it to be a very conscious move on my part. For me the big advantage of the new is proving to be direct import and being able to deal with transactions on my phone or tablet. More frequent contract with my budget is good, and less onerous than having to have the computer out/on. Faness at YNAB Here's my feedback. I've found the web UI dreadfully off-putting compared to Y4. It's the Budget panel that really gets to me. I DO NOT like the right-hand side panel at at all and there doesn’t seem to be a way to minimise or close it. My personal goals can't be put into numbers, they are simply to get through the month without robbing my savings, so I don’t need that panel. I know how much I have coming in and going out. I've got a tracking account for all my Put Aside things with Standing Orders leaving my Cheque account, spread evenly through the month so it doesn’t leave me too short in the one week in four when I don’t have any benefits coming in. The app format is tempting me to leave my darling Y4 behind, a thing that there's no way the web format wouldn’t ever do on its own. I'd like to have the two month view but that seems to have been sidelined by the limitations placed on Ynab by the apps. I'd also like to be able to vary the width of the columns in the Transaction view, but most of all, I'd love a cross-platform desktop app. That would have guaranteed my making the switch despite what I've said elsewhere about the uncertainty of the cost to me in Pounds Sterling when it comes to the annual payment. In terms of paying through the Apple AppStore, your guidance on this page (https://support.youneedabudget.com/t/k9klhz/manage-your-subscription) is somewhat iffy. The reason? YNAB isn't in the AppStore/iTunes or the Android counterparts. I had to Google YNAB's site and download that way!! I'd imagine that it is the same glitch in your guidance for Android devices. YAYYY!!!!!! Just read that you are considering a desktop app! 👏😄 I'll happily volunteer to be a Beta tester if you want an outsider to test. When would you start developing the desktop app? EDIT: I forgot to mention I don't like not always being able to scroll through the register without having to use the what-have-you along the right hand side if the browser window. Darx FYI the old forums still exist, they just aren’t indexed so they are harder to find. Most of the old timers still exist there! It’s been almost three years, and I’m still in the exact same position. I sure hope YNAB4 lives a long life. I have just taken the plunge after using YNAB 4 since 2014. It has taken me this long to at least sign up for the trial as I was reluctant for very similar reasons to OP and others here. (I have recently started University as a 'middle-age' student and the 1 year free was pretty enticing to give it a red-hot crack). Once I am further into my trial I will also likely give my feedback, but so far, my feedback is very similar to that of OP. Please bring these features back or least give options. Whilst I understand the simplicity of nYNAB for new users, it is missing one of the most fundamental components of YNAB4 - the ability to separate the months as in OPs points 2 and 3. TLDR: User of YNAB4 since 2014, just started nYNAB trial. Overall, so far I agree with all of OPs original points.